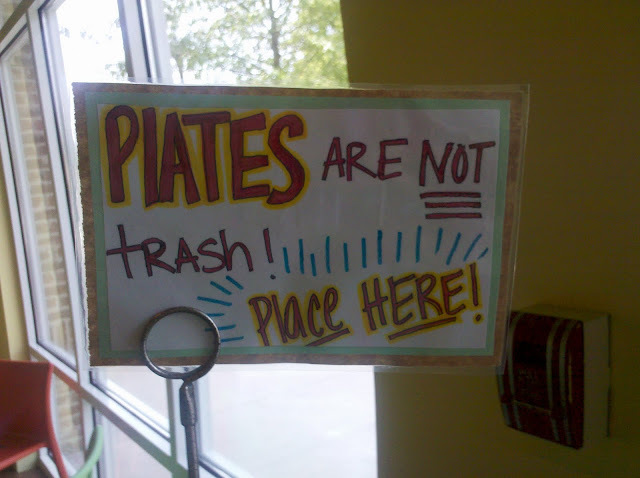 I agree with Laura B, this PlATES notification found at the Fountain of Juice in Macon, GA is confusing. It could be in reference to Pilates, or a pirate, minus the AARRRRGH. And now it's impossible to make any corrections to the message, because, in a moment of overconfidence, it has been laminated. PlATES ARE NOT trash, but this sign is. I was there again today, and the sign is still up. What makes it even funnier, I guess, is that the things they don't want you to throw away are not PlATES at all, but baskets.